Our range of bathroom towels features a host of design collections from renowned brands such as Vossen and Christy, both of whom use many, many years of knowledge and experience combined with exceptional fabrics and state-of-the-art manufacturing methods to create wonderfully luxurious towels. In 1925, Vossen was founded by Burghardt Vossen, who had the idea to transform terry toweling from a high-end, luxury product to an affordable article. Burghardt Vossen was also the inventor of the housecoat as well as the bathrobe made from terry toweling. With this kind of innovative thinking, he laid the foundation for the success story of Vossen. Vossen towels are made using the finest fabric, advanced manufacturing technologies and exceptional design ideas. All ranges of Vossen towels come in 5 sizes – face towel, hand towel, guest towel, bath towel and bath sheet. The Vossen Country towel collection of 100% cotton towels are incredibly absorbent and luxuriously soft to the touch. The classic colours and elegant design of the Country collection will bring a degree of sophistication and glamour to any bathroom. The Country towels feature a distinctive checked pattern along the border which has a contrasting colour and texture. Vossen’s new Country Style towel collection features a stylish design similar to the aforementioned Country collection, however the colours of the border pattern don’t contrast as heavily with the towel itself, giving a more subtle feel to the design. The Country Style towels benefit from Vossen’s innovative AIR pillow technology, a process which involves aligning the fibres which guarantees outstanding absorbency and an especially soft touch. Vossen’s top quality Paris Supersoft towel collection is made from 70% cotton and 30% Lyocell, which is a regenerated cellulose fibre made from dissolving wood pulp. Much like cotton, Lyocell fibres are soft, absorbent and very strong when wet or dry. The Paris Supersoft towels are available in a range of elegant colours and have a luxurious finishing with a truly super soft velour border – hence the name! 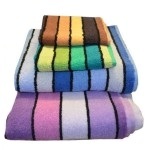 T he Vienna Style towel collection of 100% cotton towels feature a classic plain design or the Vienna Palazzo striped design. The Vienna range of towels also benefits from Vossen’s innovative AIR pillow technology as well as being 100% contaminant free and boasting a lifetime colour guarantee providing the towels are washed and maintained correctly. Skin allergies, conditions and complaints are incredibly prevalent in this day and age, Vossen have taken several steps to ensure their towels are safe and comfortable for anyone who may suffer from such problems. All of Vossen’s standard towels are medically tested and 100% contaminant-free and have held the seal of approval of the “Society for the Promotion of Skin-Tolerant Textiles” since 2010. In 1850, Henry Christy returned to England from Constantinople with a sample of looped pile fabric, which was new to the western world at the time. His brother, Richard Christy analysed how to mechanically reproduce the fabric and patented a machine to produce what would become known as terry towelling on a large scale. Christy has created towels for royalty such as Queen Victoria and Queen Elizabeth II. 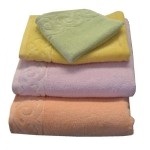 Christy towels are available in 4 sizes – face towel, which is often known as a flannel; hand towel, bath towel and the extra-large bath sheet. The Christy Supreme towel collection is made using 100% Supima Cotton, which is exceptionally soft to the touch, thick, plush and extremely absorbent. Supima cotton produces a very fine cotton yarn with extra-long fibres resulting in a luxurious feel which is evocative of smooth silk. Christy’s Supreme towels are identified as being of superior quality by the Cotton USA trademark, a worldwide symbol representing purity, strength and comfort and distinguishing products which are made from a higher percentage of U.S. cotton. The colour ranges Christy have created will allow you to choose either a single shade to make a strong statement or several shades to create a subtle combination. Christy also produce a range of cotton bath and pedestal mats in the same colour ranges so that you can complete the look you are going for in your bathroom. Also made by Christy is a range of Gruffalo towels and bath accessories to make bath time exciting and enjoyable for any little ones in your life. Bathroom Towels, Christy, Country, Paris Supersoft, Supreme, Vienna Palazzo, Vienna Style, Vossen. Bookmark. Hunter Wellington Boots Gloss vs Matt – A Fashion Dilemma!